What are the internal logic and mechanism of the descriptions of China’s mid- and long-term economic development: “the potential growth rate decline”, “the transition of growth phase”, “the economic development entering into the second quarter” and “the economy steps into the New Normal.” Starting from the theory of the catch-up cycle of the late-developing countries and taking the characteristics of current supply and demand as well as changes in the environment of international economic development, the book “Entering the Next Round of Catching-up: from Quantity Expansion to Quality Upgrade” does a research on the causes, challenges and countermeasures of China’s economic growth phase transition. It is believed that China is gradually stepping into a medium-high growth phase featuring quality upgrading driven mainly by “TFP1”and“TFP2”. At this stage, the economy will be faced with new challenges as well as new features, which will also pose new requirements for enterprises. The book has 11 chapters. Chapter 1: the Causes, Challenges and Countermeasures for Transition at the Growth Stage. 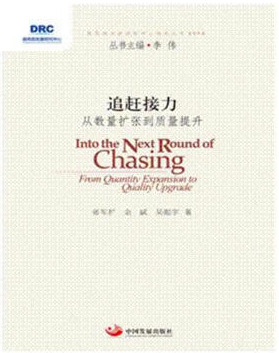 Chapter 2: Research on China’s Industrial Upgrading during the Phase of Transition. Chapter 3: the Trend of Demand Structure Changes and Growth Potential. Chapter 4: Promotion of the Transition of Open Economy and Strengthening International competition. Chapter 5: Establishment of Innovation System and Creating New Economic Growth Drivers. Chapter 6: the Growth Phase Transition, Structural Adjustment, Transformation and Upgrading. Chapter 7: the Catching-up Cycle of the Late-Developing Countries. Chapter 8: from Mixed-up to Kuznets Model. Chapter 9: Policy Options for the Countermeasures to Growth Phase Transition. Chapter 10: Domestic Comparative Study on China’s Mid- and Long Term Growth Potential and the Phase of Transition. Chapter 11: the Study and Thoughts on China’s Economic Growth Momentum by Foreign Scholars.